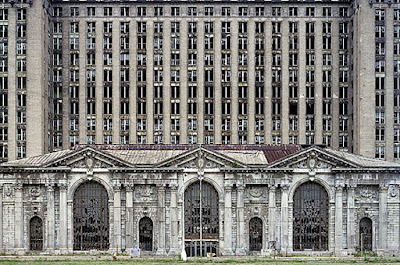 You may not have noticed with all the national media attention on the Democrat-Republican fracas over the budget, the deficit, the Obama tax cuts, and payroll tax cut political gamesmanship but by some estimates the city of Detroit is on the verge of going belly up as soon as April of 2012. Detroit has a deficit of roughly $150-200 million and accumulated debt of somewhere around $10 billion. Vendors are already waiting in some cases as long as 18 months to get paid. This has made some of the usual suspects happy but most people are angry or sad. Under the emergency financial manager law (which was given new teeth under the new Republican Governor's administration) the state has the power to appoint a manager who would have the authority to run the city, void union contracts and privatize services and sell assets. This being Southeast Michigan (one of the most segregated areas in the US) the race issue is never far from people's minds. Detroit is between 80% and 85% Black. With a few exceptions most suburbs are the reverse image of that demographic. Detroit has had black political hegemony since the early seventies or so. Within the city there is INTENSE paranoia about the idea of a white governor appointing someone to run Detroit and even more suspicion about white suburbanites taking over Detroit's "jewels". Honestly, some of this is nonsense but some of it is 100% accurate as Detroit and the surrounding suburbs have battled for decades over the Detroit Water Department, (Suburban municipalities have urged greater suburban control over the Detroit water department-a stance greatly at odds with their otherwise anti-regionalism preferences), the Detroit Zoo, the Arts Institute and Library, mass transit, Detroit's income tax on suburban workers, and many other things. Bottom line is that Detroiters feel it's their city so they get to vote and if you don't like that, quit your whining and move into the city. Otherwise have a nice long drink of STFU. Suburbanites feel that fine if you don't want our say, stop taking our money. We'll take that deal in a heartbeat. The city of Detroit has 48 different unions. They have generally refused to offer any more concessions, claiming that they've given enough. They blame bad outsourcing and private contractor decisions for this crisis. The unions have offered some ideas on solving the problem, which include such things as cutting Blue Cross Blue Shield out of the medical payment process and eliminating private contractors. The city council has seized upon an unpaid $200 million block of aid that the State of Michigan was supposed to pay Detroit as the proximate reason for the crisis. However the State of Michigan cut back aid to several localities as it is also cash poor. The city also would like the State of Michigan to forgive some of its debt and help the city to do a better job of collecting city taxes-from both residents but especially businesses. If Detroit collected all of its owed income taxes each year, the city would receive an additional $155 million annually that could wipe out the deficit in a few years and avoid massive service reductions and layoffs. 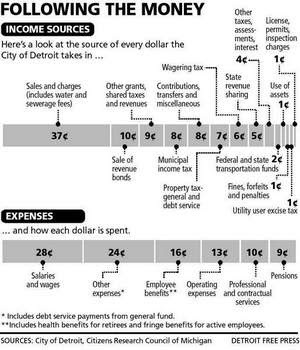 At a time when the state is about to begin dissecting the city's troubled finances, about half of Detroiters and non-Detroiters who work in the city fail to pay their city income taxes. But city officials said to aggressively go after the delinquent taxes would be time-consuming and require more employees and sophisticated technology than the city can afford. 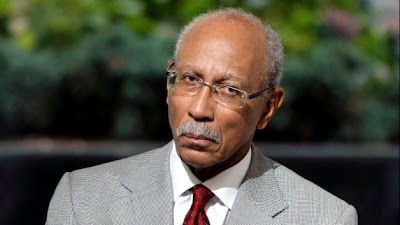 That's why Mayor Dave Bing is lobbying state lawmakers to enact a law that would require suburban employers of Detroiters to automatically withhold income taxes and electronically deposit the money into a city account. The rising costs of health care for retirees and some bad decisions with the pension fund are an additional problem. In my opinion the primary cause for this is that Detroit simply has too many costs for the population that it supports. Things that could be done when Detroit was home to roughly a million people can't be supported when only about 700,000 live there. The property tax base and income tax base no longer exist to support the current payroll and other items. There is just not enough money coming in. People have left for reasons both good and bad. But at the end of the day, they've left. All the other race-baiting and political posturing aside that's what it comes down to. It's like trying to make a monthly payment on a new Bentley Arnage when your job description has changed from international rock star to Olive Garden busboy. Eventually, the numbers turn against you. No matter how much you may hate it, you will need to accept (grudgingly and temporarily perhaps) your new reality. To paraphrase Moe Greene from The Godfather "..the City of Detroit ain't even got that kind of muscle no more!!!" Well that is indeed the million dollar question. The city council, union leaders and Mayor all came together last Friday to announce that although they had not solved the problem they would solve it and didn't need or want any outside help-period. However this was too late as the State Treasurer announced a 30 day review of the city's finances to determine whether an emergency manager would be appointed. The city is of course free to solve the crisis before then but many think this unlikely. Although it would be more symbolic than not the City Council has so far refused to cut its budget by the amounts it wants other departments or workers to accept. Detroit faces privatization of lighting, waste management the zoo, the water department, parking, parks, Belle Isle, mass transit, fire, police and other normal city services. This looms in the future, whether it be through an unprecedented bankruptcy or the emergency manager process. In short, Detroit would temporarily cease to exist as an independent political entity. Some analysts feel that emergency manager or not bankruptcy is inevitable. Others think that the both the emergency manager law and its application (most -not all-of the Michigan cities or institutions where the law has been applied or invoked are majority Black) is unconstitutional and therefore the law should be repealed. There is a petition drive to do just that. 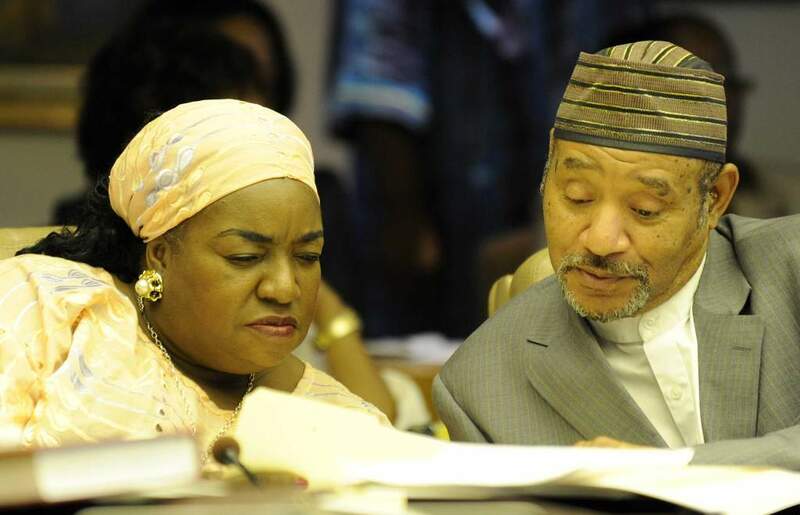 US Congressman John Conyers has also asked the Justice Department to review (i.e. block) the law. Washington — U.S. Attorney General Eric Holder is reviewing whether the state of Michigan can legally appoint an emergency manager to oversee the Motor City's finances, Rep. John Conyers, D-Detroit, said late today.Conyers said he spoke to Holder about his request that the government move to block the law. "(Holder) said, 'I've got my lawyers working on it right now,' " Conyers said, adding he spoke to the attorney general about 4 p.m. today. "He's trying to find out if my allegations of great constitutional concerns are valid. That's what he's got several hundred lawyers for. "The Justice Department confirmed Holder and Conyers spoke — and reiterated that the Justice Department is reviewing the letter.Conyers, the ranking Democrat on the House Judiciary Committee, sent a letter Dec. 1 to Holder asking him to review whether the state's emergency financial manager law is constitutional and to intervene if necessary to block it. "(Holder) told me he got the letter and he's going to act on it." My take is that even if we believe that this is a dastardly corporate Republican plan to steal and sell off Detroit's assets for their own gain while disenfranchising thousands of black voters to boot, who let things get to this point in the first place? Whether or not there is an emergency manager appointed is almost irrelevant given the cash flow needs of the city. Detroit leadership is coming in a day late and a dollar short. I mean seriously, folks. You can't say and believe in your heart of hearts that those folks over there hate us and want to control us and then behave in such a manner that shows that despite all of your protestations to the contrary, you can't successfully run your own affairs. This is not a race thing in my opinion though there are elements of that which must be addressed. It's a pure numbers situation. The costs are too high; the revenue is too low. That's been an obvious problem for at least the past 15 years. Now the bill is coming due. This is of immense personal interest as there are people very dear to me who rely on city pensions. Bankruptcy could-probably would-put some or all of those pensions at risk. This goes into uncharted territory as Michigan law places high (but not insurmountable) protections around pension payments-perhaps The Janitor or Old Guru can speak to the legalities. I'd like to believe that Detroit will find a way out of this but I really don't think it will. Time will tell. Maybe the state should just say," Fine. You the man. Handle it yourself-go bankrupt -just don't come crying to us." 1) Do you think the emergency financial manager law is constitutional? 2) Should public sector unions and outsourcing contracts have automatic spending reductions inserted based on the city's financial health? 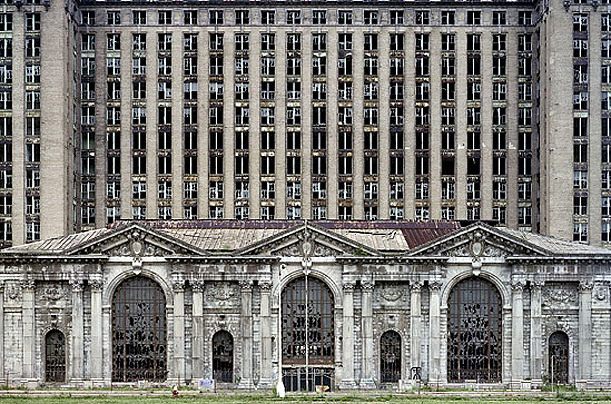 3) Do you think bankruptcy is inevitable for Detroit? 4) Why hasn't city leadership been able to craft a plan to solve this issue?